The rich worlds created in the TV series Game of Thrones (GoT) inspired a computer science class at the Technical University of Munich (TUM) in Germany: As part of their class project, the students developed applications that scour the web for data on Game of Thrones and crunch the numbers. Then they put together a website that reports which characters are most likely to die in the upcoming sixth season of the TV series. Just ahead of the kickoff for season six, the students have implemented a project that answers questions preoccupying fans of the series: Has Jon Snow survived season five? Who is going to die next? The students used an array of machine learning algorithms to answer these questions. The algorithm, which accurately predicted 74 percent of character deaths in the show and books, has many surprises in store, placing a number of characters thought to be relatively safe in grave danger. Based on these predictions, there is a good chance that the villainous Ramsay Snow (64 percent likelihood of death) will outlive his runaway captive and mortal enemy Theon Greyjoy (74 percent likelihood of death). The algorithm also gives a very clear answer on the fate of Jon Snow, who was betrayed by his friends in the season five finale. The website Got.show presents key data generated by the students' diverse machine learning tools compilation. 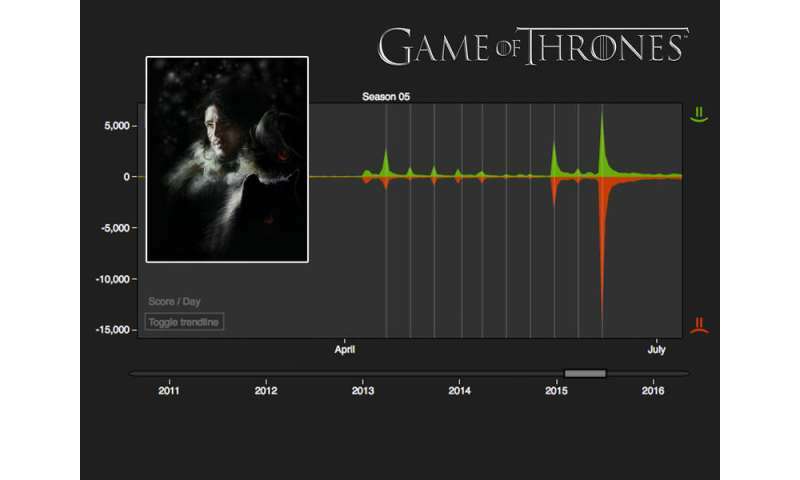 The site also tracks and analyzes Twitter user sentiments on hundreds of GoT characters. Game of Thrones Season 6 will premiere in USA on April 24th. It will also air in Germany in the night from April 24th to 25th on Sky, in both English and German. "This project has been a lot of fun for us," says Dr. Guy Yachdav, who led the class and conceived the project. "In its daily work, our research group focuses on answering complex biological questions using data mining and machine learning algorithms. For this project we used similar techniques. Only this time the subject matter was a popular TV show. The epic scale of the worlds created by George R. R. Martin provides an almost endless resource of raw multi-dimensional data. It provided the perfect setting for our class." "Data mining and machine learning are tools that enable digital medicine to benefit from modern biology for diagnosis, treatment and prevention of disease. Turning to such a 'real life' challenge created a didactical jewel, winning students for these subjects," summarizes Burkhardt Rost, Professor of Bioinformatics at the Technical University of Munich. "And the interactive visual maps created in the project might open a new approach to data visualization that we will follow up scientifically."